The Inbal – a deluxe, five-star accommodation that sits at the very heart of this thriving, bustling city, is situated in walking distance to the Jerusalem’s historic, religious, and cultural center, adjacent to the gardens of Liberty Bell Park and conveniently close to the restaurants and attractions of the First Train Station and Emek Refaim Street. Its proximity to the Old City tempts you to explore the historic sites, visit museums, enjoy the picturesque coffee shops – and experience the magic of Jerusalem. The Inbal offers a selection of immensely comfortable and generously proportioned luxury rooms and suites, and provides a wide range of exclusive amenities and services – including gourmet restaurants, a first-class spa and fitness center, a heated, semi-Olympic pool, artisan and designer shops, and a synagogue active on Shabbat and holidays. We also provide free underground parking, concierge services, and more. Whether you are looking for a romantic getaway, going on a quick business trip, or planning a family vacation, we invite you to indulge yourself at The Inbal in an authentic and purely elegant Jerusalem experience. Enjoy the ultimate in hospitality, immersing yourself in that rare mosaic of intriguing colors, sounds, tastes, and smells that Jerusalem offers. 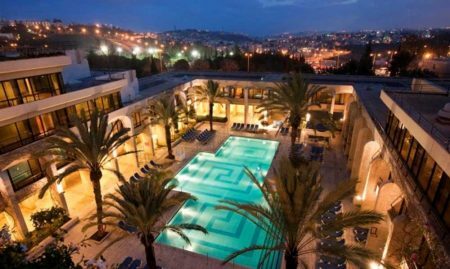 Join us for an unforgettable stay in Jerusalem – here at The Inbal. How about an indulging spa treatment at the hotel’s couple’s room with a large hot tub and chocolate fondue? Inbal Hotel Spa & Fitness offers guests a relaxing and pampering health experience. The spa offers a variety of luxurious spa treatments by experienced masseuses. If you’re more into fitness and sports, you will also find a heated swimming pool and cutting-edge training equipment at the hotel’s state-of-the-art fitness center. Enjoy a hot drink or light snack in the Inbal’s COFFEE BAR at the luxurious lobby or adjacent Jerusalem-stone courtyard. With its freshly brewed coffees and dairy menus, this charming COFFEE BAR offers a range of grilled toasts, snack platters and fresh salads. You can also order breakfast, served all day, and − just for the kids − there’s pizza, pasta and cheese toast. If you’re looking for something sweet, you can’t ignore the exquisite desserts prepared exclusively by the accomplished Patisserie chefs of the hotel. WiFi is free, for any guest who orders coffee and cake. Looking for the ideal setting for your special occasion? Inbal Hotel offers elegant event facilities for both intimate and large-scale celebrations of all kinds: birthdays, anniversaries, bar/bat mizvahs, weddings, corporate events, gala dinners, and more. The hotel’s ballroom can accommodate up to 550 guests in a banquet style, or 650 guests for a cocktail reception. If you’re looking for something a bit more intimate, you will also find private dining spaces for 20-200 guests with luxurious amenities and personalized service. The hotel’s catering services are provided by the hotel’s Executive Chef and his expert staff that will make sure your event will run smoothly and in a spectacular fashion. Are you planning a large, international conference, a small meeting, a training session or a seminar? The Inbal Jerusalem Hotel offers premium facilities suitable for a wide range of engagements. With clients as diverse as El Al, Teva, the annual Conference of Presidents and SMX Israel, the Inbal has one of the biggest conference facilities for events and conventions in Jerusalem. Versatile and tech-friendly, our elegant venues, state-of-the-art audiovisual equipment, exquisite cuisine, and experienced, dedicated staff allow you to maximize the effectiveness of every event.Are you planning a large, international conference, a small meeting, a training session or a seminar? The Inbal Jerusalem Hotel offers premium facilities suitable for a wide range of engagements. Book your stay at the Inbal hotel near the Old City and enjoy a variety of special offers at the hotel’s official website! For more information dial +972-72-3944577. Part of a tour group, we wrapped up our trip with 4 nights at the Inbal. My bedroom and bathroom were very clean and the bed was luxuriously comfortable, even without a top sheet (which none of the luxury hotels on tour had either). I was impressed that they featured Ahava bath products. As an engineer, I appreciate the very efficient elevator system (reminiscent of the Marriott Marquis Times Square). The staff were helpful and we had special accommodations for dinner during Shabbat. Otherwise, the buffet breakfasts and dinners were delicious; the fresh fruit available made for great midday snacks. The only nitpick I have is that we used the travel guide provided in the room to do the recommended walking night tour; unimpressive but this is not the hotel's fault. The hotel is within walking distance to the Old City and we felt safe on our route. This hotel is a fantastic combination of everything you need in a Jerusalem hotel. It has two (and more) kinds of rooms that offer both lovely and luxury, a sophisticated and gracious level of service, and beautiful amenities. The location is absolutely perfect, situated just across a valley from the Old City, down the road from the city center, and down the road as well from the Emek Refaim district and First Station as well. The hotel breakfast is a typical Israeli breakfast--gigantic buffets of beautifully prepared foods. The restaurants and room service are delicious, perfectly done and always prepared thoughtfully as well. The hotel was renovated a few years back and is even prettier than before, seemingly with brighter, lighter public spaces, a lobby that is not large but is filled with stunning flower arrangements, and everything new and fresh looking. For summer, a beautiful, large pool and a nearby park...for winter, warm heat and fabulous in-room tea service with delicious Israeli teas. The hotel is of course family friendly and welcomes families of all sizes. We stayed here 5 nights as our base in Jerusalem during our recent tour. Hotel is fabulous. Somehow we ended up with a handicap room and the open shower in the bathroom just kept most of the bathroom wet. Otherwise, the room was great. Very comfortable bed. Plenty of outlets for electronics. Marble bath with large vanity and plenty of counter space. Good quality towels. Dinners for the group tours staying at the hotel was in the ballroom on a lower level. Buffet with wide selection of food. Something for everyone. Breakfasts were in restaurant on the lobby level. Excellent. Staff was friendly and helpful. Would definitely stay here again.